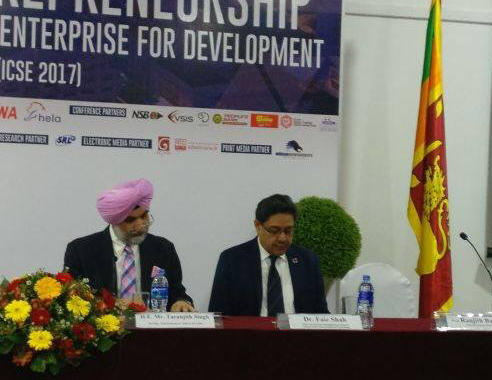 The Colombo School of Business and Management (CSBM) organised the Second International Conference on ‘Social Entrepreneurship’-Innovations in Social Enterprise for Development (ICSE 2017) on 1 December 2017 at the Sri Lanka Foundation Institute. The Conference Partners were the Asian Institute of Technology (AIT), Bangkok and the Colombo Plan. High Commissioner of India to Sri Lanka Mr. Taranjit Singh Sandhu was the Chief Guest at ICSE 2017. Mr. Kinley Dorji, Secretary General, Colombo Plan, Mr. Dian Gomes, Chairman, Colombo School of Business & Management, Prof. Ranjith Bandara, Head, Colombo School of Business & Management, Dr. Faiz Shah, Director, Yunus Centre, Asian Institute of Technology, Bangkok and Mr. Channa De Silva, Chairman, Sarvodaya Development Finance Ltd., Sri Lanka were also present at the inaugural session. In his inaugural address, Mr. Sandhu spoke about the several initiatives and policy measures instituted by Government of India to foster a culture of innovation and entrepreneurship in India. He added that Sri Lanka also has a strong tradition of innovation, and that there is a lot that we can learn from each other. He also spoke about technology as a great leveller, and social entrepreneur has the potential to offer small solutions to big problems. He noted that innovation and entrepreneurship are critical for development, not just because they enhance productivity but they also address social issues in a novel manner. He urged Sri Lankan youth to make use of the varied learning opportunities provided by Government of India under Indian Technical & Economic Cooperation (ITEC) programme, various scholarship programmes and S&T research innovation programmes. As you are aware, innovation and entrepreneurship are critical for development. They enhance productivity by leaps and bounds. That’s not the only reason why it is important. They address social issues in a novel manner. They have the prowess to make societies more inclusive. They craft social empowerment. The theme of this year’s Conference, ‘Building an Intellectual Economy to Foster Socially Innovative Enterprise Development’ is apt in every sense. In today’s day and age, technology is a great leveller. As Prime Minister Modi has said, today there is an “app” for filling every gap! A farmer can today find out the best farming methods, thanks to his mobile phone. A fisherman can tie up the best price for his day’s catch while still at sea. Students can access online courses from the best Institutes in the world, sitting in the comfort of their homes. Today, we see and speak with friends and relatives spread across continents almost daily, that too almost free. Behind all these sea changes, is not just technology, it is someone who found out the best use of technology to contribute to the society, a social entrepreneur who thinks differently. We have launched ‘AIMtoInnovate’ with over 900 Atal Tinkering Labs to promote a culture of innovation among children. Numerous incubation centres have been set up in various universities in India to nurture innovative startup ventures.